Let’s just say, my previous plan is dead in the water since nothing really went according to plan. There were many circumstances that I wasn’t aware of and the events just took a completely different course from what I’ve laid out. However, just as I was going with the flow, I did complete one part of the required items. So far, I only have the Enchanted Rubber, but I have purchased 4 Titanium Alloy Mirror from the Market Board and currently have 1 Unidentifiable Shell. The reason for this is because of the limited beastmen quest allowance. 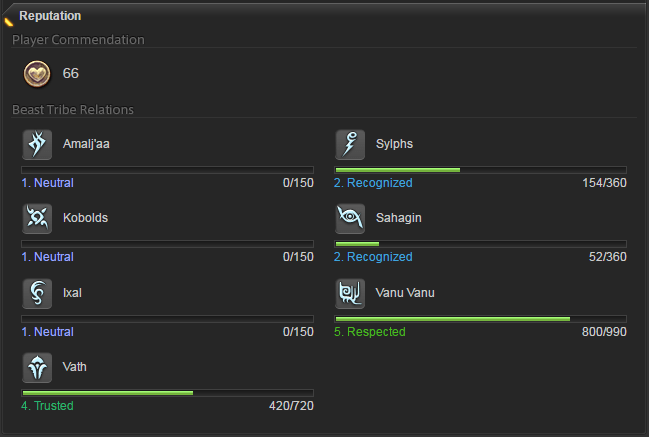 I cannot do the Vanu Vanu and the Vath daily while I’m trying to increase my reputation with the Sylphs and Sahagins. The Sylphs and Sahagins grant 6 quests; 3 quests worth of 5 reputation points and 3 quests worth 7 points. So in order to increase my reputation with SnS, I’ve decided to allocate all 12 allowance doing both dailies — meaning I’m not gathering enough of the Vanu Vanu and the Vath tokens. I figured that once I start collecting tokens from the Sylphs and Sahagins, it only takes 3 tokens to buy the item I need. How many tokens I can get per day is still a mystery — hopefully I can get 2 tokens a day from each tribe. There is also another option since I’ve been doing daily dungeons, guildhest, and a lot of FATEs with my Ninja, I’ve collected a lot of Company Seals. These seals will save me a lot of money on acquiring the Dispelling Arrow and Kingcake — too bad I can’t use it for the Unidentifiable items. This allowance limitation left a sour taste in my mouth that I stopped playing the game and decided to play something else. A friend recommended a game to me and it’s a tactical card game called Faeria. It is a good game, however, since it is a new game, released March 8, 2017, it comes with a lot of bugs. There is this annoying flashing light after each battle that after a while gives me a headache. The game also crashes often enough that progress is lost and just last night, I lost server connection while in the middle of playing an Epic Mission. So yes, I was very frustrated when the server disconnected me and it didn’t help that I was already salty about FFXIV. So I went and look for another game to play and I found that Diablo III: Reaper of Souls is only $19.99 so I went and upgrade my game and played for several hours. I stopped playing Diablo III because it lost that “omg loot” effect that this kind of game typically aims for. Just like playing Torch Light 2, Diablo III is all about getting the sweet loot. When Reaper of Souls rolled in, I wasn’t that excited about it even though it came with a very cool Crusader class. So yes, the game became a last resort for me when other games I like to play stopped being fun. I will still play FFXIV, but only if I can progress in the beastmen reputation, otherwise, I rather have my character sit by the Aetheryte to accumulate rested XP. After upgrading my Diablo III, I started the game to continue where my Demon Hunter left off only to find that my progress on that past of the story was overwritten by the story of the expansion. So yes, I was pissed — but I took a deep breath and went along with the continuum story basically after the defeat of Diablo. Good thing that I calm down and played the game anyway because Reaper of Souls blows my mind in the first couple of hours. The map is huge and by my estimation, it’s at least twice as big. In Normal mode, the map feels empty and a bit boring so I up the difficulty to Hard mode and that’s some very fun gameplay right there. 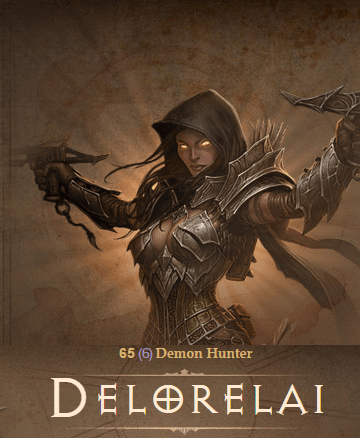 Of course, I took my Demon Hunter although my Barbarian and Wizard can also go, but I like playing my Demon Hunter more — also the voice actor of the female Demon Hunter (Anna Graves) is simply perfect. As the title of the expansion suggests, the game is about the reaper of souls and man, talk about major messed up. I’ll write a post about my new adventure in Diablo III at a later time, I’m still at a point where I’m looking for Adria in the swaps — omg spoiler, really? The expansion was released almost 3 years ago the nothing should be a spoiler anymore. So right now, my gameplay time will be split between getting my Anima Weapon and Reaper of Souls.